With so much material out there, what should you focus on? How much time do you spend on a certain topic? How do you progress? How do you measure progress? Chris covers all of these topics in this lesson. People go through different phases of life which can define the type and intensity of practice that is possible: Being younger and dependent on family for income or a time of unemployment etc... Will allow you to structure your practice differently than if you are working 3 jobs and are a single parent of 3 kids. 4. Application phase: practice time tapers off, you learn how to make money at what you do. Spend more time "working" with your guitar than you do practicing. It is possible to be in more than one phase at a time. It is possible to go back and forth between phases. Composition and Creation (writing licks, songs, backing tracks, melodies... whatever, just make sure YOU are coming up with it -- also includes playing with others. One other note: Make sure practice time is actual practice time. It's easy to get in to the mode of playing with bands, songwriting, recording etc... and not actually spending time focusing on just practice. All of these things really do help you improve as gain experience as a guitar player, but there is no substitute for being regular in alone time practicing with your instrument. If you have limited time, or you need another effective way of practicing, check out my article on the 30 minute guitar workout concept. Hey Chris, I've worked through several of your lessons and just wanted to say thanks. Your practice suggestions are very helpful, I'm going to apply your ideas. Hi, Chris. I`m really frustrated about my speed..... I consider myself as an intermediate player, just trying to move to the focus phase, but my speed block me to do most of the licks..... as a paradox, getting speed is really a slow process? :) Tks. I want to learn 50's and 60 lead and improvising country music and would the practice of technique be different for practicing this type music?? Cheers Chris, there is some great stuff here that I need to spend time working on. As you mentioned im one of those players that has stepped back into the scary intermiedate spot light after years many years spent in the focused and application stage with the goal of expanding my overall playing. What would you say to someone who excelled in certain categories but needed more work in others? For instance, I have a pretty thorough knowledge of chords, theory, and I've written lots of songs, but my musicianship is in major need of development. I'm tempted to think my "hour" would be best spent purely on technique, since it's my main weakness. hey chris just want to let you know ure a really good teacher. Insightful!! My problem is that I get stuck on a particular aspect of guitar and give it too much time to master it..But now I think it keeps my playing stagnant..I never achieve my goal perfectly and it makes me frustrated...Need your help..thanks for helping!! check out my article called "30 minute guitar workout concept" here on the site. It'll help a great deal with that stagnation your talking about. Thanks for following the lessons! Great lesson! What about some time spent playing and singing songs you like and memorizing them? That seems to keep me motivated, but I'm not sure how much I improve during the considerable time it takes me to commit some songs to memory. Learning songs is great, but I always thought of them as 'extra' or not included in real practice. I'll take aspects of things that I picked up from learning songs and make those things the objects of my practicing, say a challenging lick or something. but stuff like learning other poeple's songs, jamming with friends, etc... I've never really considered that to be practice, though it may still help you improve. This is so helpful. I have been so busy lately my practice time has become scarce so I am really excited to use your suggestions to help me really focus my practice time. Thanks! Instrumental Rock carries with it many creative aspects both in writing and playing. By the end of this series, Chris will have covered almost everything you will need to know to create and play your very own melodic instrumental rock piece, with emotion! Chris Liepe introduces his Phase 2 Rock Essentials lesson series. By highlighting specific instrumental rock styles and techniques, Chris will help you become a more melodically creative player. Chris introduces the pentatonic scales as well as some of their basic applications. Chris Liepe takes some time to explain chord numbering. Understanding how chords are built will only help in your overall knowledge of the guitar. Chris breaks down the CAGED system and its chord chemistry. He covers both major and minor chord forms. Chris digs into the sweep picking technique. He uses the C, A, and E forms introduced in the previous lesson to help with finger synchronization. Chris moves on to the subject of modes. He explains where modes come from, how they sound, and how they are used. This lesson demonstrates how to modify the old trusty 5th fret A minor pentatonic position to make it sound modal. How do you know which mode to use? There are giveaways with every chord progression, and Chris covers them in this lesson. Chris demonstrates how to complete the major and minor scale by using pentatonic positions based on the roots of the I, IV, and V chords. Chris Liepe utilizes everything he has taught in the series so far to demonstrate how to create catchy lead lines over a backing track. Chris Liepe delves into the world of implied tonalities. 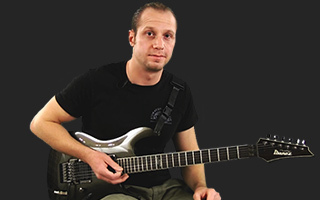 This lesson details how a single arpeggio can be implied over various chordal sounds. Chris teaches the solo that was used in the introduction lesson for this series. He uses the solo as an example of how to effectively compose your own solos. It's time to give the right hand hand some work with two hand tapping on the guitar neck. Chris Liepe offers up some insight into his past. Hopefully this lesson will help you further your own goals as a guitarist.